Hello my name is Joey Prince a firefighter from Hendersonville NC. 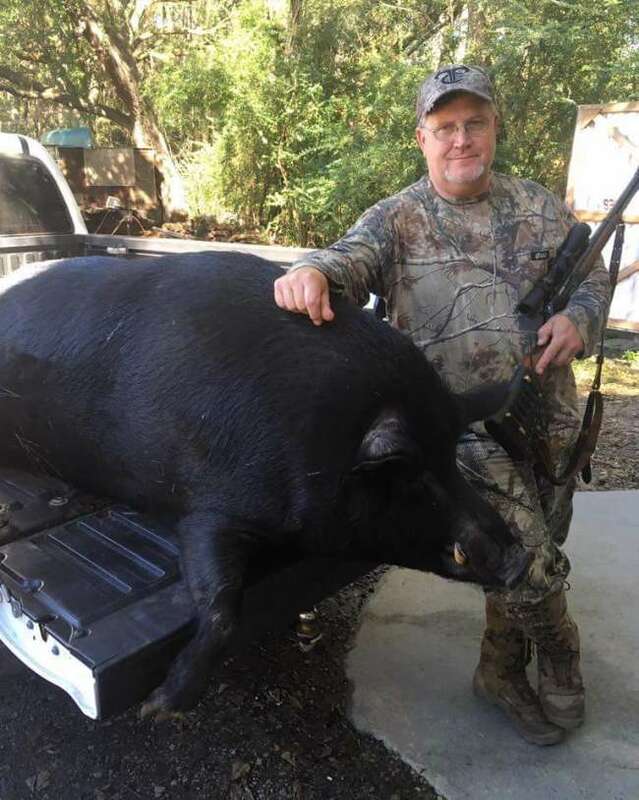 I took this 520lb boar hog at 12 noon on October 20 in Orangeburg County while deer hunting over a soybean field. The hog was bedded down in the middle of the field and got up approximately at 85 yards and stood broadside to me. I took the first shot with my Marlin 336 lever action 35 Remington. The bullet struck just behind his shoulder and he ran to the back of the field and stopped broadside to me again. My second shot found it's mark again and he ran into the edge of the woods and hid in a thicket. As I approached him, I had to take a third shot to finish him. We had to use a backhoe from a local farmer to get the hog out of the woods and loaded him in my truck. Carried him to Butcher Boys Deer and Hog processing in Summerville and had him weighed on their scales at 520lbs. Butch the owner of Butcher Boys stated this was the largest hog he had ever checked in at his facility!